Architecture is all about art and beauty and feeling good inside a building right? Wrong. Architecture is also all about codes and actual wood framing sizes vs nominal and how are you going to make sure that skylight won’t leak. Recently, I started working for a firm called Communitecture as a project manager/project architect. We are so busy that we are looking for another person who can lead projects by herself as well. We’ve talked with quite a few people and looked at quite a few resumes. What has become apparent in our search is that there are plenty of women just starting out but we’ve come across zero women with a substantial amount of experience in the field. This personal experience in our candidate search is backed up by statistics. The American Institute of Architects calls it The Missing 32%. Ideally there should be 50% men and 50% women in leadership and senior positions in architecture, but in reality there are 82% men and 18% women. Many women drop out of the field before even getting licensed, much less reaching a senior level. “The number of women who are AIA members, licensed architects and senior leadership varies between 15% to 18% of the total. While the exact percentages is in constant flux, the challenge of losing the large pool of architectural talent remains the constant,” it says on the Equity by Design webpage. With my 40th birthday coming up next year, I am by no means a senior architect. But I do have my license and I have been in the field longer than many women have, even including my 4 year hiatus from the field. I am at a stage in my career where I am asked to lead projects. From this vantage point I see that my colleagues are mostly men and looking further up the experience ladder, they are almost exclusively men. The saying goes that architecture is an old man’s profession. It seems that women don’t tend to grow old in the profession and that’s a sad loss for architecture. 1. Become technically savvy. It is not enough to have people skills and be a creative designer. Study up on the code more than your male counterparts. Go out there and build something. Get to know construction methods intimately. Ask your boss if you can accompany him or her to the construction site. Ask questions. It’s ok to ask questions! Build something, anything, whether it be a book shelf or a planter in your back yard, or a shed, or whatever you set your mind to. 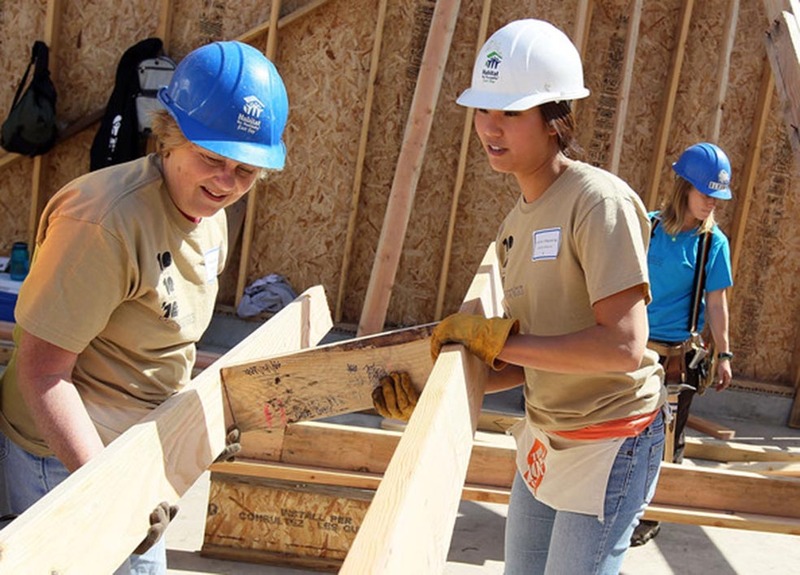 If building something by yourself intimidates you, volunteer with organizations that build things like Habitat for Humanity or the Village Building Convergence or Depave (which deconstructs asphalt pavement, but it’s still a valuable building experience). Building things helps you understand how things are built. That may sound like a tautology, but hands-on experience is an obvious but largely missing piece of the architect’s education and it’s so very necessary. It’s even more necessary for women to have hands on experience in construction because as unfortunate as it is, women lack credibility when it comes to constructability issues. We have to actively demonstrate our competence and knowledge to gain the credibility that a man has just by virtue of being a man. 2. Get licensed! I know several male architects who have reached high levels of leadership without getting licensed. They are very talented and competent and they made their way into leadership for excellent reasons. Getting licensed does not necessarily say much about how talented and capable you are as an architect. But it does say that you’ve put in the time to get the required experience and have the basic knowledge to legally practice as an architect. Men can get ahead more easily without getting their license, women don’t have that luxury. Therefore, ladies, it is essential that you get your license. It will give you credibility and open doors for you. It will empower you to do everything from social justice work to building a skyscraper. Even if you decide to leave the profession, having your license will continue to serve you. It may seem unfair that you need this piece of paper to prove your competence, but it is the world we live in. And unfortunately, this is true even more for women. 3. Don’t take on the negative traits typical of men to excel. Architecture offices can often be competitive environments where public humiliation, cold interpersonal interactions and a sole focus on the work at the expense of humanity are common. I’ve seen situations where principals can drive their employees to put in 80 hours of work in a week without so much as a nod of acknowledgement, often taking all the credit and sometimes being so hard on team members that tears become a regular part of going to work. This is one of many arenas I feel that women can have a positive impact on the profession. We do not have to take on the domineering and crushing aspects of some of our male counterparts in leadership to be effective leaders. Reintroducing humane hours, humane interactions within the office and with clients, and ultimately a humane architecture into the world is our opportunity as women. And lastly, I entreat women in architecture to show more confidence! I have seen young males fresh out of college display more confidence that women who’ve been in the practice for many years. This much is true for both men and women: you can’t know everything and you are constantly learning about new materials, products, soil issues, codes, and the list goes on. But it is essential that we as women become competent in the technical aspects of architecture and show up with confidence to then be able to take the profession to new heights. Photo Credit: Photo from Habitat for Humanity of Nodaway County. Nice blog. In 1983 there were 13 women in my graduating class of 45 students (after two years of just 1 or 2 women). We thought we were on our way and others would follow. I think your article is just the thing to encourage women architects who look to us for mentorship and inspiration. I enjoyed reading your post and certainly agree with your advice. I have been working in the field for almost 20 years and just recently recommitted to getting licensed after kidding myself into thinking it didn’t matter & wouldn’t make a difference. Architecture is such a dynamic profession that attempting to know it all is an uphill battle, which is an assault to those that struggle with maintaining their confidence. I think we progress by being authentic and telling our stories. As well, mentoring others with the wisdom that life is a constant learning experience and practice makes progress other than perfection. Your site is certainly a voice for change – make your site a portal to educate the younger generation of architects (what had you wished someone told you early in your career), list events that will teach technical skills or linked resources that share communication skills or stories as to why it is important to be licensed. Thanks so much for taking a stand! I’m looking forward to hearing your voice at the ForWARD Equity Event in November!